These conclusions were derived on the basis of numerical modeling and analytical methods of physics. 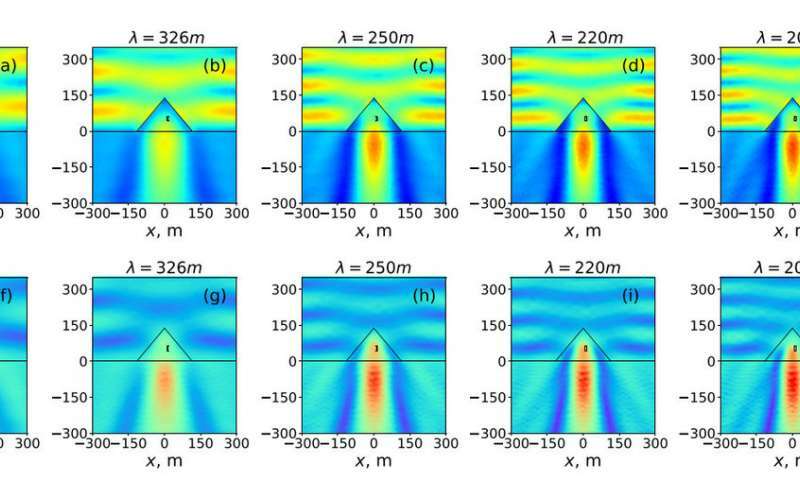 The researchers first estimated that resonances in the pyramid can be induced by radio waves with a length ranging from 200 to 600 meters. Then they made a model of the electromagnetic response of the pyramid and calculated the extinction cross section. This value helps to estimate which part of the incident wave energy can be scattered or absorbed by the pyramid under resonant conditions. Finally, for the same conditions, the scientists obtained the electromagnetic field distribution inside the pyramid. In order to explain the results, the scientists conducted a multipole analysis. This method is widely used in physics to study the interaction between a complex object and electromagnetic field. The object scattering the field is replaced by a set of simpler sources of radiation: multipoles. The collection of multipole radiation coincides with the field scattering by an entire object. Therefore, knowing the type of each multipole, it is possible to predict and explain the distribution and configuration of the scattered fields in the whole system. The Great Pyramid attracted the researchers while they were studying the interaction between light and dielectric nanoparticles. The scattering of light by nanoparticles depends on their size, shape and refractive index of the source material. Varying these parameters, it is possible to determine the resonance scattering regimes and use them to develop devices for controlling light at the nanoscale. "Egyptian pyramids have always attracted great attention. We as scientists were interested in them as well, so we decided to look at the Great Pyramid as a particle dissipating radio waves resonantly. Due to the lack of information about the physical properties of the pyramid, we had to use some assumptions. For example, we assumed that there are no unknown cavities inside, and the building material with the properties of an ordinary limestone is evenly distributed in and out of the pyramid. With these assumptions made, we obtained interesting results that can find important practical applications," says Dr. Sc. Andrey Evlyukhin, scientific supervisor and coordinator of the research. Now, the scientists plan to use the results to reproduce similar effects at the nanoscale. "Choosing a material with suitable electromagnetic properties, we can obtain pyramidal nanoparticles with a promise for practical application in nanosensors and effective solar cells," says Polina Kapitainova, Ph.D., a member of the Faculty of Physics and Technology of ITMO University.